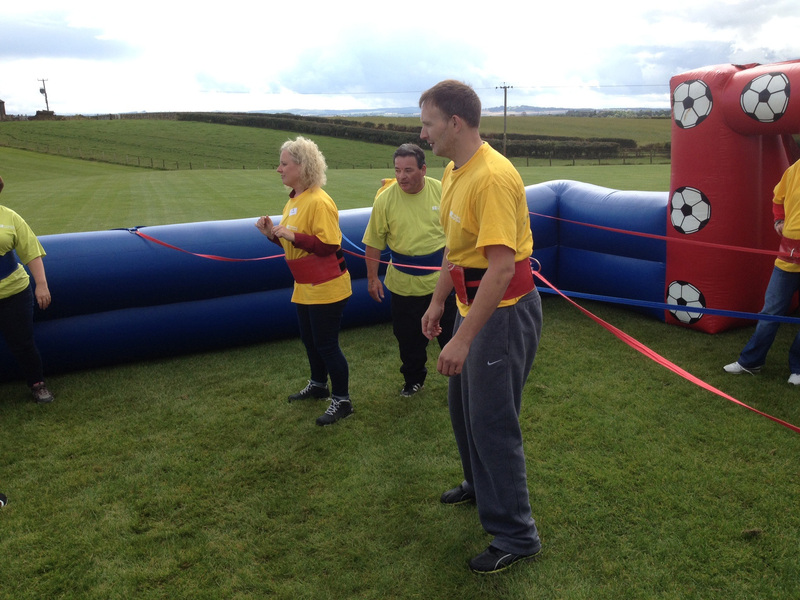 The lovely grounds at Forester Park in Cairneyhill saw a Wild, Wet and Wacky, It's A Knockout, corporate activity days, for Fife Housing. Despite some grey clouds there were 8 teams ready and raring to battle it in both fun races and inflatable activities including; Human Table Football, Human Demo, Bungee Run and Gladiator Duel. Once the teams had been allocated coloured t-shirts team names had to be picked. We had; Misfits, Mutts Nuts, Lynn's All Stars, Team Team, Pink Panthers, Steve's Terminators, Wolf Pack and Team Bogie, named after their green tops. After a thorough Warm Up, that had everyone taking their jackets off, it was time to start the competitions. First up was the Caterpillar Race, the teams had to get into a loop of material and move as a team up and back down the course. The Wolfpack proved their pack like nature taking an easy victory while Lynn's All Stars and Steve's Terminators struggled not to fall over one another. The first set of rotations saw the Pink Panthers take on Steve's Terminators on the Human Demolition. Steve's team fought hard to knock the Panthers off their platforms but they proved too hard to beat and took 5 wins to just 1. Meanwhile over at the Gladiator Duel it was the Mutts Nuts that where coming out victorious successfully beating the Misfits to take the top score of 1000 points. They continued to show their strength on the Bungee Run when they take on Wolfpack who had to experienced their first loss so far in the day while the Misfits got their chance to taste victory on the Human Table Football. Next up was another race, this time the Gold Rush. 4 teams went up at a time, jumping in the sack to race to the bottom of the course. The quality of jumping from the Misfits was phenomenal and they narrowly missed out on top points to Lynn's All Stars while the Pink Panthers were only just managing to jump one way down the course never mind the other. Back to the rotation games and all the teams were hoping to get more wins. On the Human Demolition the Misfits and Mutts Nuts were equally matched and both teams were awarding 1000 points while it was Team Team that took away the winnings from the Human Table Football and the Duel successfully beating their competitors. Steve's Terminators, who were yet to win anything, came back fighting hardest though winning both the Duel against the Pink Panthers and the best score of the day with a 4 - 1 victory over the Misfits on the Bungee Run. It was time for the teams to get really wet with the next race of the afternoon, The Clown Around. After using space hoppers to reached the end of the course they had to retrieve letters from the soapy water in the clown bouncy castle to make the longest word they could. This race proved to be the challenge for the Mutts Nuts, who had only lost one game so far and came away with nothing while the Misfits took a strong victory with the word, "Today". "Fleets" was the winning word for the Pink Panthers, who found space hoppers easier to bounce than sacks whilst there was a lot of debate over the Wolfpack word, "Zingy" and despite trying the flirting tack-tick came they came in last. The final race was the Ski's. The Pink Panthers continued the victorious streak, coming together as a team to get themselves and their ski's down the course and then over the inflatable assault course. Unfortunately Steve's Terminators luck had run out and they came in last. In the second round though all the teams were put to shame as the Misfits team lived up to their bragging, flying down the course on their skis and completed the race in record braking time. All that was left to do know was the add up the scores and announce the winners of the Team Challenge Company Winner’s Trophy. There had to be a last place too though, or winner of the Wooden Spoon and that team was Team Bogie with just 3800 points. In 7th place came the Pink Panthers while just 100 points separated the Misfits, Steve's Terminators and Lynn's All Stars in 4th 5th and 6th places. Just ahead of them taking 3rd position were Wolfpack while just missing out on the top spot were Team Team. The winners though with a fantastic 5400 points were Mutts Nuts who took home the Trophy and a lot of smiles. Thank you so much to Nicola for organising a great day was had by all and we look forward to meeting with you all again.